The original title was Mena. It sounds exotic, like it should be the word for “money” in another language. It’s really just the name of a small town in Arkansas, former residence of a pilot named Barry Seal. A few months ago, execs changed it to American Made. Out of context, it’s a hopelessly generic yawn. But now that I’ve seen the movie, it makes perfect sense. Seal, the hustling man of the skies that screwed over the CIA and the Colombian drug cartel back in the 1980s, was a true product of our country. Same goes for the 10,000-watt-smiling actor standing by himself in the poster. 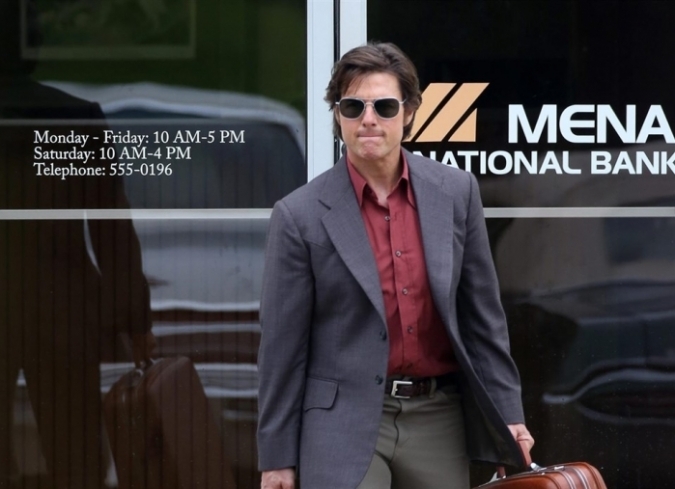 The last time Cruise played a pilot, he sported Ray-Bans and felt the need for speed. First sign that Adler Berrimen “Barry” Seal is the bizzaro version of Maverick: In the opening scene, his TWA pilot makes his plane go bump in the night and freaks out his passengers just to mess with his dozing co-pilot. The year is 1978 and Seal has been at his job for more than 30 years. He’s restless. One night, a charmer named “Schafer” (Domhnall Gleeson) sidles up to him in a bar and recruits him to take photographs over Colombia while posing as a CEO for an aviation company named the Independent Aviation Consultants. IAC. Hmmm.. what other word can you make from those initials? His work attracts the attention of a young Pablo Escobar and his cronies. They ask him to smuggle drugs between Colombia and Louisiana. If he obliges, he’ll be handsomely rewarded. He goes for it. The daredevil in him also can’t resist the challenge. Even achieving lift-off on a makeshift dirt runway gets his adrenaline pumping. So Seal fills up his private Cessna plane with bricks of cocaine and drops them in the swamps mid-air. Then Schafer has him flying guns to Nicaragua as well as potential rebels back to the U.S. for training. By the mid-80s, even the beleaguered Colonel Oliver North is asking him for favors. Seal doesn’t provide insightful introspection as to why he constantly puts his life at his risk. “I’m the Gringo who delivers!” he explains in an amusing voiceover. 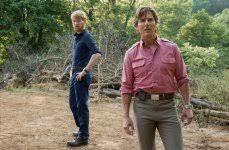 (Cruise just barely pulls off the Southern accent.) Is his rationale as clear-cut as the man just feels the need, the need for more cold hard cash? Perhaps. After the family uproots to Mena, he and his pretty, greedy blonde wife (Sarah Wright) can’t launder the dirty money fast enough. We’re talking millions. The intoxicating influx of funds and displays of hedonism are reminiscent of a Cold War Goodfellas. The inevitable fall is not nearly as sophisticated as that Martin Scorsese classic, of course. It’s also not quite as funny as the Wolf of Wall Street. In fact, after Todd Phillips’ War Dogs last summer, I’m burned out on thrill-seeking white guys making a crapload of illegal money only to see their empire spectacularly blow to pieces. 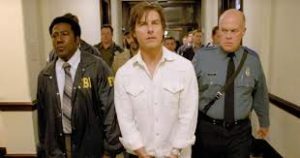 The formula is so well-tread that not even the sight of Cruise covered in cocaine powder after a plane crash can shake it up. We get it: No anti-hero, no matter how charismatic, gets away with get-rich-quick gambits. Still, what an awfully fun ride to the top. That’s the American way.